Part of Canada Film Days. Inspired by John Vaillant’s award-winning book, 'The Golden Spruce,' this environmental thriller/doc looks back at the mysterious, unsolved disappearance of forestry engineer and ecology activist Grant Hadwin. “Rather than remind us again that we’re all doomed, this haunting environmental doc accesses a deeper and much stranger area of inquiry. Most British Columbians will remember when Grant Hadwin felled the venerated golden spruce on Haida Gwaii in 1997, a devastating and perverse act of ecoterrorism that broke the hearts of the Haida people while leaving others to ponder the former forest technician’s sanity. 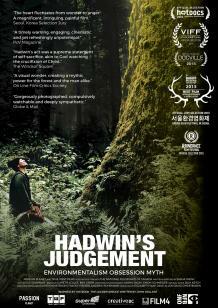 It’s to filmmaker Sasha Snow’s credit that he refuses to pass any judgment of his own on Hadwin, favouring the notion that his subject’s preternatural empathy for the old growth he was increasingly reluctant to destroy came as a visionary transformation as much as any kind of emotional rupture. "By all accounts, along with his mystical bent, Hadwin was endowed with superhuman survival skills. Snow mingles the on-screen testimony with kinetic, breathtaking scenes of stuntman Douglas Chapman, as Hadwin, inside the rainforest he revered. Sickeningly effective footage of the violence we do to nature completes the picture.